With sweeping ocean views from atop rolling hills, this property lies just minutes from the picturesque beach resort town of Cayucos. 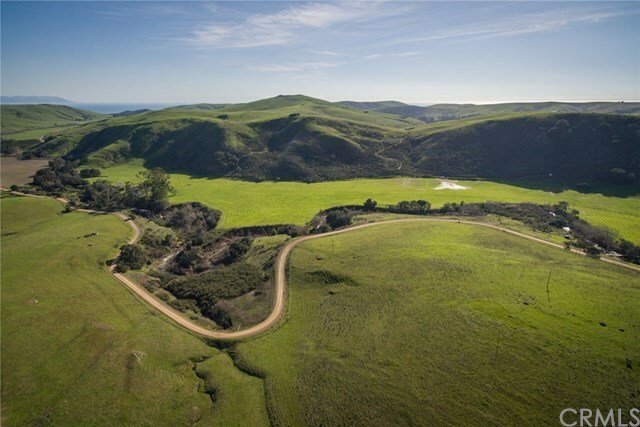 The 1,024Â± acres includes 2 parcels which feature 40 acres of prime flat farming land, a creek, 4 cattle corrals, a vintage farm house (currently not in livable condition), shed, bridge, rolling hills, valley, large ridge line, and good road access. Water includes 4 wells (including ag and domestic), 3 water tanks (two 5,000 gall. and one 2,600 gall. ), 8 cattle troughs, two year-around natural springs, one seasonal spring which feeds a cast-iron trough, and an additional 3 poly tanks which feed 15 concrete cattle troughs. The 40 acre dry farming flat land is currently used for farming oat hay. Both parcels are enrolled in the Williamson Act, estimated to save the landowner 20-75% in property tax liability annually, according to the California Department of Conservation. The two parcels are also being sold separately.